With the world becoming increasingly digital by the day, it’s important to feed into the fast-paced nature of the online world. This is where QR codes come in. They’re not much to look at; in fact, they just look like weird, blurry barcodes, but the power lies in what they do. When scanned by a camera or smartphone, the codes automatically bring up information that has been inputted, whether it’s a website address, a social media profile, or a landing page. They can be generated and placed anywhere and everywhere, from stickers and posters, to business cards and even billboards. This has made life a whole lot easier for those dishing out information. If you received a business card in the past, you had to manually type in the web address or social media handle into your phone or computer. With a QR code, you simply scan and go. The digital world is getting more and more saturated by the day. Even the tiny, family-run florist on the corner of your street has an online presence, making it more difficult than ever for businesses to get leverage over their competitors. With so many options, consumers can literally take or leave any business if it doesn’t suit their needs. And what do people today need? They need things quickly, and they need them now. Think about the mega success of next-day delivery, instant downloads, and the ability to find out anything with the tap of a finger. Laboriously typing in email addresses and web URLs is an arduous task that people don’t have to do anymore. If they have to, they can just go elsewhere. Having a QR code on your business card that instantly takes prospects to your website gives you the edge over your competitors that don’t do this. So, by making it as easy as possible for people to find you after networking, you’ll land more followers and more customers. Imagine Joe Blogs has just got back from a three-day conference where he networked every day and night, meeting potentially hundreds of businesses along the way. He gets home and unpacks the slew of business cards he picked up - and we’re talking hundreds of business cards here. It’s highly unlikely he’s going to visit the websites printed on every single card (in fact, 8 billion of the 10 billion business cards printed each year get tossed away within a week), but he might scan a QR code quickly to see what comes up. This will instantly make your brand stand out among the others, and it will increase the chances of Joe Blogs (or any prospect) following up with you. QR codes make it super simple to give out your information to prospects. With just a quick scan, they can bring up a wealth of information about your brand, and you can pick and choose where they take your prospects. Maybe you want to direct them straight to your social media accounts so they can follow you there, or maybe you’ll guide them to a landing page where they can find out more about your services. Keeping your business cards on-brand can be difficult if you have multiple employees that regularly go out and network. The great thing about QR codes is they can be individualized for each member of staff without affecting the core branding of your business cards. You can keep the design exactly the same on each card and simply set up a QR code for each employee that takes prospects to their specific email address or contact page. With Brandly, you can save your “master” design and customize it for each employee from one dashboard. It’s easy for each member of staff to go into the dashboard and add their own QR code to their card. The design of your business card will often dictate how memorable it is. Getting the branding right means prospects will recognize your business when they come to follow up, and it also gives you a chance to show off your personality. Business cards are only small with a very limited amount of space to put information. This means it’s easy to over-stuff a card with text and information, making it overwhelming for the receiver. With a QR code, you’re essentially packing all the juicy information into a barcode-sized space, leaving you plenty of room to showcase your branding elsewhere. Now you know how QR codes can make your business cards stand out, here’s how you can create and implement them. Step 1: Choose a QR Code Generator - there are plenty to choose from and most are really simple to use. Step 2: Choose the information you want to promote - most generators have a section for you to input a web address, landing page, or social media profile, so choose where you want prospects to be taken when they scan your code. Step 3: Customize your QR code - you can make your QR code look like your logo, add your brand colors, or include social media handles too. Bear in mind that the more you customize your code, the harder it can be for some QR readers to scan it, so it’s sometimes better to keep it as simple as possible. Step 4: Test your QR code - if there’s one thing you absolutely need to do before putting your QR code on your business cards, it’s test it. A dud code means you’ll lose out on potential customers rather than gain them, and they might also lose trust in you. Step 5: Download your QR code - once everything’s ready to go, download your QR code so you have it saved and ready to add to your business cards. Once you’ve generated your QR code, it’s time to put it onto your business cards. Here, you want to make sure you’ve got your design worked out in advance so that your code can seamlessly become a part of it (we’ve pulled together a selection of real-life QR code business card examples below for inspiration). This pastel-colored design has fully embraced its branding in the QR code. As you can see, the code has been customized with colors and made to reflect the illustrated design style of the card. This card features an embossed image that’s relevant to the business card owner, with the QR code fully incorporated into the design. The QR code on this card has been made transparent for a fun and tactile alternative. The QR code on this card is the centerpiece. It is printed large, taking up most of one side so it definitely can’t be missed. This card has been printed in a square design to reflect the shape of the QR code which takes pride of place and covers one entire side. 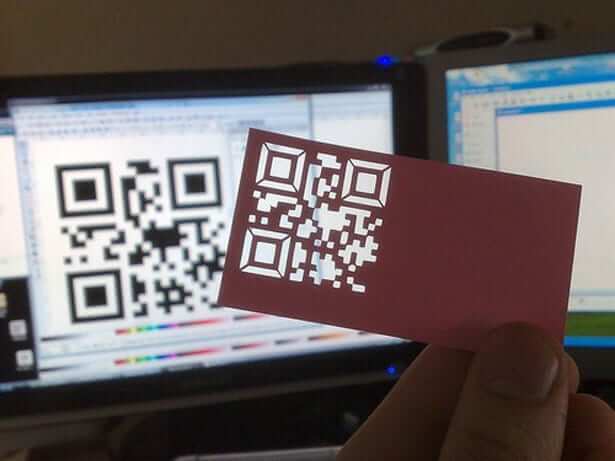 This design isn’t your usual shaped business card, showing that you can incorporate a QR code in any style or design. Unlike the example above where just the QR code was transparent, this card is entirely see-through with the QR code front and center in the middle. Most business card printers will happily print your business cards with a QR code on. Once the code has been incorporated into the design, it simply becomes just another element of the card. Brandly makes it really easy for you to add your individual QR code to a business card design and print it on high-quality card. In the dashboard, you can add multiple different QR codes to your core design to send prospects different information depending on the member of staff they have connected with. Alternatively, if your ultimate aim is to send prospects to your Instagram page to connect with you there, you can create a specialized Instagram Nametag card through Brandly that works just like a QR code. You can find out more about that in this post. Business cards are still going strong in the business world, but it’s time for the physical nature of them to catch up with the fast-paced digital world. This is exactly what QR codes do. Instead of requiring prospects to manually type in the information printed on your card, they can simply scan your code and get taken to a designated page of your choice. This makes connecting with new customers quick and easy, while ensuring your brand stays at the front of their mind. If you want to stand out over your competition, QR codes really help bridge the gap between your real-life business and online presence. Stay up-to-date with the latest business card trends by signing up to our newsletter.